You may have spent lots of time and money refreshing your website, but how well does it actually perform on people’s desktops and mobile devices? If it’s too slow, people will give up and go elsewhere, so loading speed is important to monitor. Thanks to Google, you can test the speed of your website plus receive suggestions for improvement for free. 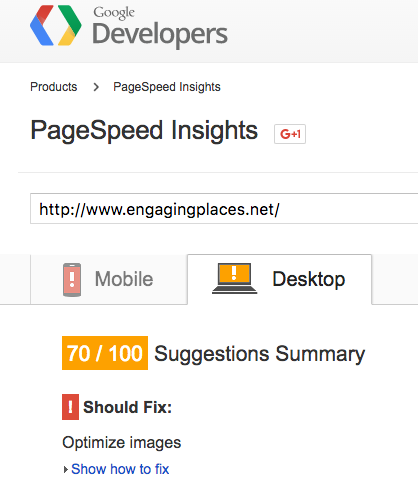 Go to PageSpeed Insights and enter your website address. In a few seconds, you’ll receive a detailed report. EngagingPlaces.net scored 70/100 for desktop performance and if you think that’s low, I checked a couple of my client’s websites and they fared much worse. If you’d like to learn more, watch the Dotto Tech video “Episode #47: Importance of Site Speed” that explains how he redesigned his WordPress website to perform better. This entry was posted in Technology and tagged Google+, Website on July 20, 2016 by Max van Balgooy. The other high-priority item for historic sites and history organizations is ensuring that their site functions well on mobile devices. Thanks, Lee! Hadn’t heard of Pingdom but wow, it has great information (and it turns out that EngagingPlaces.net is faster than 69% of the sites it has tested!). Although the free version of Pingdom doesn’t provide an analysis of your website on mobile devices (perhaps the paid version does), Google’s speedtest provides comparisons between desktop and mobile.